Demonstration of this library: WebXR Coffee. 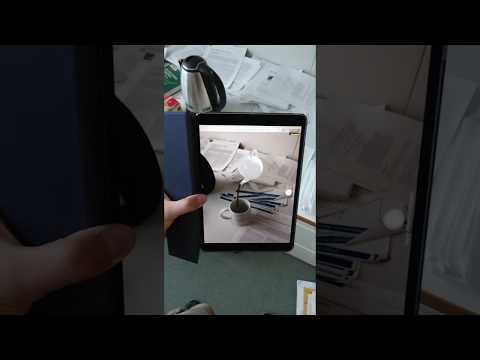 The tea cup is detected and a 3D animation is played in augmented reality. These are some demonstrations of this library. Some requires a specific setup. You can subscribe to the Jeeliz Youtube channel or to the @StartupJeeliz Twitter account to be kept informed of our cutting edge developments. If you have made an application or a fun demonstration using this library, we would love to see it and insert a link here! Contact us on Twitter @StartupJeeliz or LinkedIn. These demonstration should work in your browser if you have a webcam. To run these demonstrations, you need a web browser implementing WebXR. We hope it will be implemented soon in all web browsers! If you have and IOS device (Ipad, Iphone), you can install WebXR viewer from the Apple store. It is developped by the Mozilla Fundation. It is a modified Firefox with WebXR implemented using ArKit. You can then open the demonstrations from the URL bar of the application. For Android devices, it should work with WebARonARCore, but we have not tested yet. you need to validate the specific device using a QR code or a link (it is very well explained in the 8th wall get started document). Instead of giving the URL of the neural network, you can also give the parsed JSON object. <int> canvasSize: size of the detection canvas in pixels (should be square). Special value -1 keep the canvas size. Default: 512. [<float>, <float>] ZRotRange: only works if followZRot = true. Randomize initial rotation angle. Values are in radians. Default: [0,0]. The function which triggers the detection is JEEARAPI.detect(<int>nDetectionsPerLoop, <videoFrame>frame, <dictionary>options). <int> nDetectionPerLoop is the number of consecutive detections proceeded. The higher it is, the faster the detection will be. But it may slow down the whole application if it is too high because the function call will consume too much GPU resources. A value between 3 and 6 is advised. <float> thresholdDetectFactor: a factor applied on the detection thresholds for the detected object. The default value is 1. For example if it equals 0.5, the detection will be 2 times easier. IOS: value optimized of IOS devices for WebXR usage only. Copy the red channel into the other color channels and apply a 5 pixels median filter. <float> thresholdDetectFactorUnstitch: stop tracking if detection threshold is below this value. Used only if isKeepTracking=true. Should be smaller than thresholdDetectFactor. <float> detectScore: detection score of the detected object, between 0 (bad detection) and 1 (very good detection). JEEARAPI.set_scanSettings(<dict> scanSettings): see Scan settings section for more informations. The WebXR demos principal code is directly in the index.html files. The 3D part is handled by THREE.JS. The starting point of the demos is the examples provided by WebXR viewer by the Mozilla Fundation). We use Jeeliz AR through a specific helper, helpers/JeelizWebXRHelper.js and we strongly advise to use this helper for your WebXR demos. With the IOS implementation, it handles the video stream conversion (the video stream is given as YCbCr buffers. We take only the Y buffer and we apply a median filter on it.). "INVALID_CANVASID": cannot found the <canvas> element in the DOM. This error can be triggered only if canvasId is provided to the init() method. "NOTFOUND_NN": The neural network model is not found, or a HTTP error occured during the request. <int> h: height of the cropped area, in pixels. <boolean> sweepShuffle: if we should shuffle scan positions or not. Default: true. The demonstrations should be hosted on a static HTTPS server with a valid certificate. Otherwise WebXR or MediaStream API may not be available. Be careful to enable gzip compression for at least JSON files. The neuron network model can be quite heavy, but fortunately it is well compressed with GZIP. The input size is the resolution of the input image of the network. The detection window is not static: it slides along the video both for position and scale. If you use this library with WebXR and IOS, the video resolution will be 480*270 pixels, so a 64*64 pixels input will be enough. If for example you used a 128*128 pixels input neural network model, the input image would often need to be enlarged before being given as input. This library uses Jeeliz WebGL Deep Learning technology to detect objects. The neural network is trained using a 3D engine and a dataset of 3D models. All is processed client-side. If WebGL2 is not available, and if WebGL1 is not available or neither OES_TEXTURE_FLOAT or OES_HALF_TEXTURE_FLOAT are implemented, the user is not compatible. the steps to reproduce the bug, and screenshots. Apache 2.0. This application is free for both commercial and non-commercial use. We appreciate attribution by including the Jeeliz logo and a link to the Jeeliz website in your application or desktop website. Of course we do not expect a large link to Jeeliz over your face filter, but if you can put the link in the credits/about/help/footer section it would be great. Jeeliz main face detection and tracking library is cJeeliz FaceFilter API. It handles multi-face tracking, and for each tracked face it provides the rotation angles and the mouth opening factor. It is perfect to build your own Snapchat/MSQRD like face filters running in the browser. It comes with dozen of integration demo, including a face swap. Our deep learning based library Weboji detects 11 facial expressions in real time from the webcam video feed. Then they are reproduced on an avatar, either in 3D with a THREE.JS renderer or in 2D with a SVG renderer (so you can use it even if you are not a 3D developer). You can access to the github repository here. If you just want to detect if the user is looking at the screen or not, Jeeliz Glance Tracker is what you are looking for. It can be useful to play and pause a video whether the user is watching or not. This library needs fewer resources and the neural network file is much lighter. If you want to use this library for glasses virtual try-on (sunglasses, spectacles, ski masks), you can take a look at Jeeliz VTO widget. It includes a high quality and lightweight 3D engine which implements the following features: deferred shading, PBR, raytraced shadows, normal mapping, ... It also reconstructs the lighting environment around the user (ambient and directional lighting). But the glasses comes from a database hosted in our servers. If you want to add some models, please contact us.